Knitting is a great hobby and a favorite pastime of many women. I want to knit, when you go to the shops for the sale of products for craft, seeing a variety of colourful yarns of different types. Saturated and unique colors fascinate and make you dream about new things related to yourself and loved ones. The quality and look of any knit product depends on a properly selected type of yarn. Modern shops offer many types of yarn, such as linen, wool, cotton, silk and other. Most offers from different types of wool. It is great for knitting things that are needed for the cold season. Wool is characterized by elasticity, breathes and retains heat. A small drawback is the formation of pellets. So sometimes it adds a certain amount of plant fibers or artificial. Crochet soft and warm children's clothes great yarn from Merino wool. It is more expensive than another, but does not irritate baby skin. Beautiful and quite pleasant for the skin things knitted from Angora wool. Angora wool is the perfect yarn, which is acrylic, Merino wool and Angora. Angora wool is soft and fluffy, warm and pleasant. Good option, from the wool of camels. But, it is only a few colors: natural, black and dark. But the yarn of Alpaca wool has about 22 shades of color. It is characterized in that the things related of her perfectly worn, do not have pellets. In addition, things warm and beautiful. Quite soft and lightweight yarn for knitting cashmere wool. But it has so much rolled into pellets, so for knitting it is included with other types of wool. Their niche popularity has long earned mohair yarn. She spun from synthetic or wool threads. Things associated with this material is fluffy and original, but they need good care. Huge success with knitters now uses yarn from cotton. It is well suited for skin, has a different color does not fade in the sun. But it also has some disadvantages: not flexible, dense, long dries. Yarn for knitting of flax, the most strong, absorbs moisture and dries quickly. Its disadvantage is that it is poorly vypilivaya and heavily painted. The special demand uses the silk yarn. It's good and convenient for knitting beautiful things for spring and summer. Knitted from this yarn and products are not deformed, have a beautiful color. Besides these types in the sale is a different yarn of artificial staple fibres: of acrylic, which has viscose; yarn in which there is artificial silk and so on. 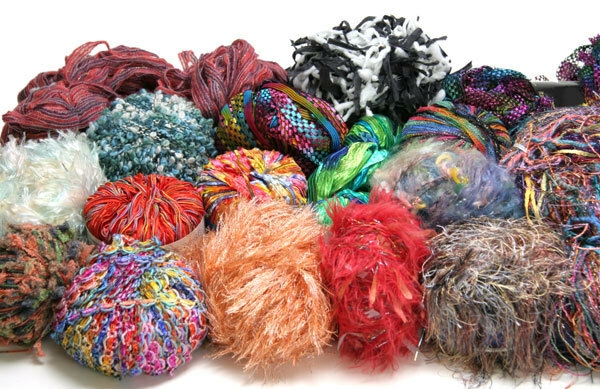 Various blended yarns are perfect for knitting things for kids and adults. Selection of products for knitting is so varied that sometimes get lost for a long time and think about what you choose to associate a beautiful thing.